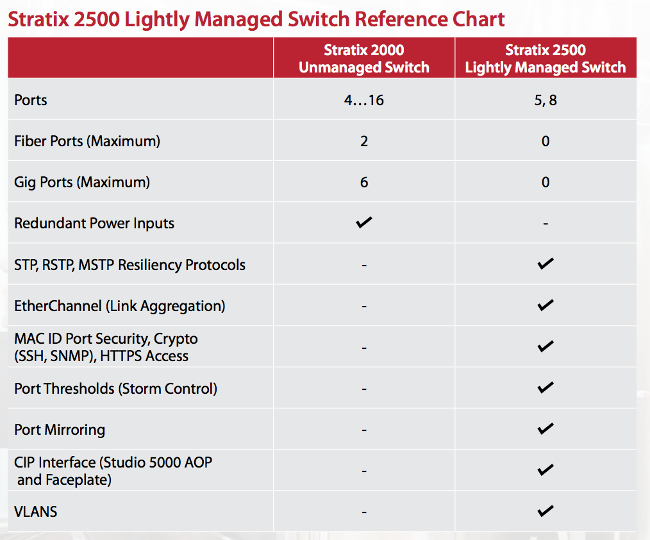 The Stratix 2500 Lightly Managed Switches bridges the gap between unmanaged and managed switches. It can save you on your in-panel networking costs, due to it's lower cost. It adds some of the managed switch features, but not all, so you can plug and play right out of the box with preconfigured settings and logix profiles. This way it can be more secure and productive at a lower cost. The Stratix® 2500 Lightly Managed Switch enables network connectivity in applications where traditional unmanaged switches lack the ability to provide network resiliency, diagnostics and security, allowing you to achieve higher productivity and network reliability. The Stratix 2500 is offered in 5 and 8 10/100 Mbps fast Ethernet copper port versions in a compact design. Its consistent delivery and prioritization of traffic, on a per-port basis, helps ensure that the critical traffic is delivered end to end with priority. It can be installed in the network in two ways. By using the default, “out-of the-box” installation, you can prioritize network traffic and commission the device faster. Configuring the switch allows you to enable security, resiliency and bandwidth optimization features needed for today’s industrial networks.